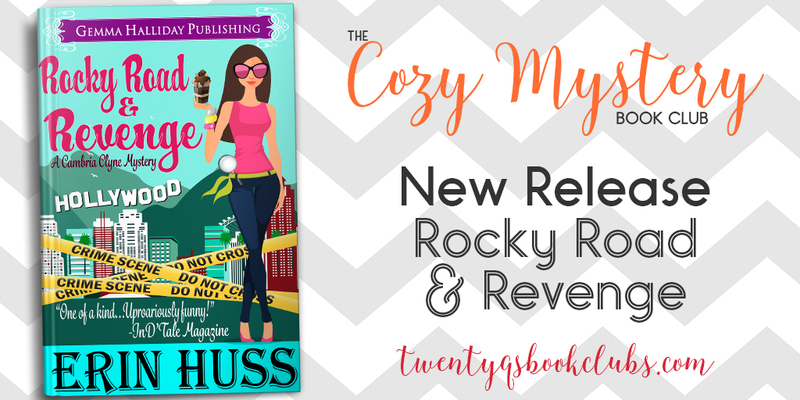 Happy Release Day to Erin Huss! 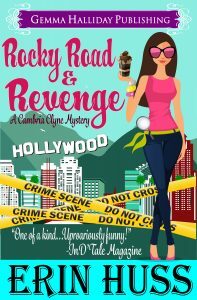 Her new cozy mystery, ROCKY ROAD & REVENGE, is out now! “It’s the police,” I whispered to Amy, trying to keep my cool. She fell against the wall like she’d been shot in the chest. I told her to stay put and opened the door enough to shove my head out. Standing in front of me was Chase, wearing the same suit as earlier, though his tie was pulled loose. His partner, Hampton was behind him. His tie was always pulled loose. I was sure Hampton had a first name, but Chase called him Hampton, so I did too. “Hi, how may I help you?” I smiled in what I hoped was not an I-may-or-may-not-have-a-person-of-interest-hiding-behind-my-door kind of way. “Momma, your phone isn’t working! There’s the spinning thing!” Lilly hollered from the bedroom. “That’s fine with me.” The corner of Chase’s mouth twitched upward. “I’ll come in, and Hampton can stay out here.” He took a step toward me. An episode of If Only came to my head. A dialogue between the lead character, Bobbie Dart, and Detective Russell, about successfully lying to the cops. Don’t pause, don’t talk too fast, don’t give out too much information, no hand motions, and stick as close to the facts as possible so you don’t trip on your words. Of course, on the show, the cop in question wasn’t a romantic interest. Yeah, OK, I can’t do this. Amy looked up at me with a helpless expression and shook her head. Make him go away, she mouthed. “Please.” She was on the verge of tears, and I broke. “Fine,” I hissed through gritted teeth. “Don’t make any noise.” I swallowed a few times. Took a few breaths. Pulled what I hoped was a poker face, and reopened the door. I promptly shifted my eyes to Chase’s feet. He had on black shoes with scuff marks on the right toe. “I’m not sure where Amy is now,” I said. Chase shifted his weight to his heels. “Has she ever talked about her relationship with Jessica Wilders?” Hampton asked. “Do you know why she didn’t come to work today?” Chase asked. “Could you call Amy and see where she is?” Chase asked. “No. If you want to talk to her, then you can call her yourself. She’s my best friend, and I can’t be in the middle of this.” Even though, technically speaking, I was in the middle of the two of them. Quite literally. Chase and Hampton shared a look, and I had a feeling they weren’t buying it. “That means an attempt to locate,” Hampton said. If I wasn’t mistaken, that was a threat. Chase was threatening me. If I weren’t near a stroke, I might have been turned on. “I will pass this on to her when I see her—if I do, which I probably won’t because—I have a thing tonight. A—” Stop talking, Cambria. Close your mouth and prohibit words from exiting before they arrest you. “OK. I better go!” I closed the door. It bounced off Chase’s shiny black shoe, leaving a new scuff mark. He studied me, and I almost caved. “Happy birthday, Cambria,” he finally said. “Thanks,” I managed. “You too.” I closed the door and fell back against it. Did I just say “you too”? I beat the back of my head against the door. “I told you I’m being framed.” Amy wept from her spot on the floor. “I just lied to Chase.” I slapped my hands over my eyes. What was I thinking? “So what? I lie to Spencer all the time.” She put the bag up to her mouth and breathed. “Your boyfriend is a dentist. Mine’s a human lie detector. That’s what. This isn’t good.” I went back to beating the back of my head against the door while Amy breathed into her bag.